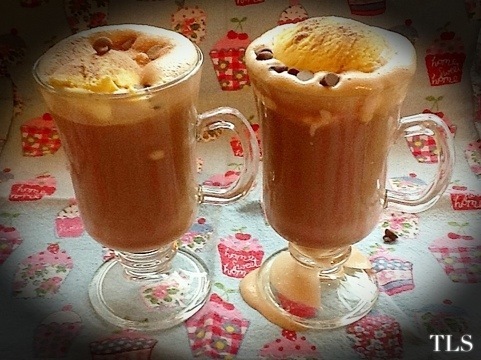 Baileys Ice Chocolate Cappuccinos! | details in the fabric.. This is a wonderful way to use up the last of the Baileys you bought over Christmas! Click below to read on – see the recipe and make your own! This is a simple, fun and easy recipe! Preparation time is a minimal 5 mins, and each glass contains roughly 1.48 units of alcohol. The recipe is for one.. so make sure you double/triple/quadruple the ingredients as needed!! Warm the milk in a small pot until it’s approximately body temperature. Add the Baileys and the chocolate and stir until the chocolate is melted. While the milk mixture is still warm, pour it into a coffee plunger and pump the plunger up and down until the milk is very aerated and foamy. Pour into a glass or mug and add the vanilla ice cream. Dust with the powdered chocolate and sprinkle with chocolate drops! Original recipe by Ben O’Donoghue. Adapted by TLS. Previous Fringe! Next Kitty Snoozes..
Keep doing what you do Ms. TLS. You do it so well.